Would snow tonight give rise to excusable delay tomorrow? Image courtesy of The Weather Channel. Is it just me, or has it been exceedingly gray and wet in Raleigh-Durham, NC so far in 2013? 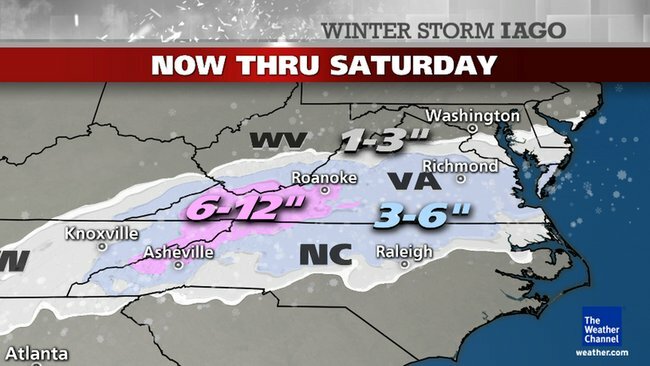 Heck, forecasters are even calling for 3-6 inches of snow overnight in the Triangle (note to self: pick up milk, bread and other essentials during the lunch break, before the grocery stores shelves are predictably and thoroughly picked over). The unusually dreary skies around here of late have me thinking about the intersection between the weather and construction delay claims. Specifically, I’ve been ruminating on this question: when is a contractor’s project delay excused by nasty weather? Now, back to the weather. While commercial owners and the agents they employ tend to exercise a lot of control over construction projects, they generally can’t control the weather. And because the weather is beyond the control of owners, it’s difficult, if not impossible, to blame owners when the weather is so bad that work can’t proceed. Sure, in rare situations, an owner may have the ability to cover all or part of a site to permit work to move forward despite bad weather, and in those rare situations, a contractor’s weather claim might be compensable. But let’s not complicate things. Weather delays are rarely compensable, and at least for present purposes, we’re going to assume they are never compensable. Instead, let’s assume that a very wet weather event, consisting of heavy rains dropping more than an inch of rain a day over the course of three days, hits a two-acre commercial project during placement of footings and foundations. Let’s further assume that the owner had no reasonable ability to cover the site to allow work to proceed while it was raining cats and dogs. Finally, let’s assume that the site needs two days to dry out when the sun finally returns, resulting in a total five-day cessation of work activities due to the storm. Is this five-day delay excusable or non-excusable? (1) Check What the Contract Says. The contract — particularly if it’s with the U.S. Army Corps of Engineers — may expressly define what weather events are considered “normal” for the geographic area where the project is located, or even recite the number of days estimated to be lost due to seasonal weather patterns. If so, the contractor should have incorporated those days into its baseline schedule, because they will not provide grounds for excusable delay if project work is stalled as a result of such “normal” weather conditions. If adverse weather conditions are the basis for a Claim for additional time, such Claim shall be documented by data substantiating that weather conditions were abnormal for the period of time, could not have been reasonably anticipated and had an adverse effect on the scheduled construction. Examples of causes beyond the control of the CONTRACTOR include, but are not limited to, the following: … adverse weather conditions not reasonably anticipated. These terms put the onus on the contractor to prove unusually severe weather not reasonably anticipated at the time of contracting/baseline scheduling. Which takes us to Step 2. (2) Check Historical Weather Data. For a contractor to request a time extension for unusually severe weather he should demonstrate what the weather was that he experienced and compare this with historical weather data normally taken from the National Oceanic and Atmospheric Administration (NOAA) records for that area. Normally, the weather data comparison is for the preceding five-year period. The NOAA may charge a small fee to access the weather data needed, but it’s a cost that must be incurred to establish excusable delay as a result of unusually severe weather. (3) Contact a Construction Attorney Immediately. to determine if a consultant should be retained to demonstrate how the weather event affected your project’s critical path. More often than not, weather-related time extension claims will be part of a broader package of delay-based claims submitted at the end of a construction project. Even if that’s the case, you’ll want to make sure your rights and pertinent evidence are preserved for the claim resolution process. To that end, make sure notice is sent up the contractual chain timely in accordance with your applicable contract documents, and bust out your smartphones and/or cameras immediately after the storm to thoroughly document field conditions. Your lawyer will thank you.